We all look at the blue sky, and we see him … A mighty abyssal dragon, coming for us. The dragon comes crashing down with his wings on the ruins, and an epic fight occurs. Music gets even more intense, me and Iron Bull charge onto the ancient beast, while Varric and Vivviane support with ranged attacks and magic. We finally finish off the beast, putting it to rest. This is what Dragon age Inquisition is made of, small memorable moments that will linger in your mind for months to come. It’s an experience that pushes both the RPG genre and storytelling in video games steps forward. The game is not afraid to throw you right into the action from the beginning. It starts with a huge threat that puts the whole world into the brink of destruction. but it’s also not afraid to introduce the contradictory object to that threat … Which is you ! The player. You get to be the Thedas’s (The world of dragon age) most interesting person, the one person who was nothing and became everything. So, plot is pretty simple, what’s the fuzz all about ? This has to be one of the best well written games I have ever played. the attention to the smallest details is spectacular. You get to feel the authenticity of this world based on many things such as characters, places, lore, events, and even the smallest of details such as a conversation, a drawing on the wall, or a statue the represents something in the overall lore. I’d like to start with how diverse the cast of characters are. Each companion you get in the game feels distinctive, they’re full of sheer personalities and attitude. You get the serious one, the sarcastic, the wise, the troubled, etc … And the way your relationship with them develops is nothing short of beautiful. every choice you make affects them in some way, sometimes they approve of your choices and sometimes they don’t. These approval ratings lead to some special side missions and encounters/dialogue with that character. as a result you get to know them better and end up with memorable encounter that makes you feel attached to each and everyone of these characters. throughout my whole playthrough I would keep thinking “Is that character hating me for that choice I made ?” or “Should I take that character with me in this missions because he’s somehow related to it?” … I keep thinking of them as if they’re real people that I know, and that is a rare thing to find in a video game. One of the finest and most memorable companions you’ll see in an RPG game. I would also like to mention the lovely conversations the characters have with each other, for an example : Dorian, a wit and charming mage from Tevinter, and Iron Bull, a one eyed Qunari mercenary who hates people from Tevinter … Pick them together with you in a mission, and this happens. This is one of the Many ! conversations these two will have together that are related to their personal backgrounds, not to mention their solo comments on the world/missions or the other characters conversations. It is just extraordinary to see how much work has been put into bringing those characters to life. Kudos to the writing team at Bioware, a job done spectacularly ! 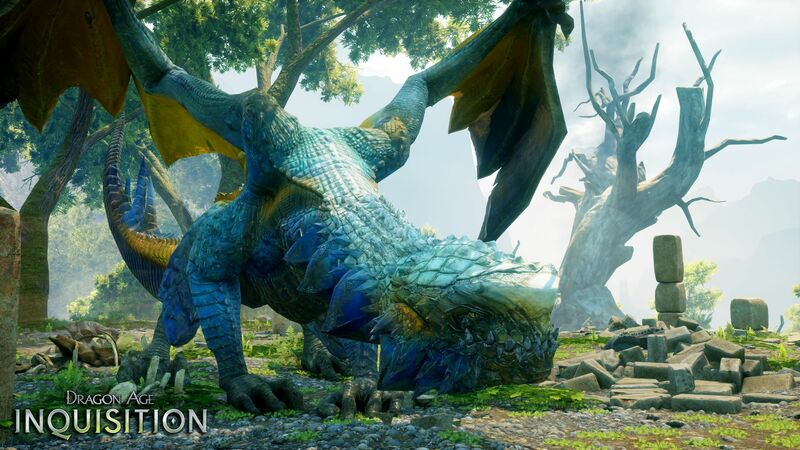 Dragon age Inquisition takes it into the next level, almost all of Thedas is available for you to explore through specific areas that open up as you progress, and they’re humongous! A single area would be as big as Dragon age 2 overall. But you get the fear that if they created a world this big, there won’t be variety since in the lore each part of the world has it’s own distinctive touch. But there is a lot of variety ! from the beautiful nature of the Hinterlands, to the harsh desert of The Western Approach, from the gloomy and bleak Fallow Mire to the Icy and blue Emprise du Lion. Though the lack of cities is kind of a disappointment, since there’s only one city in the whole game. 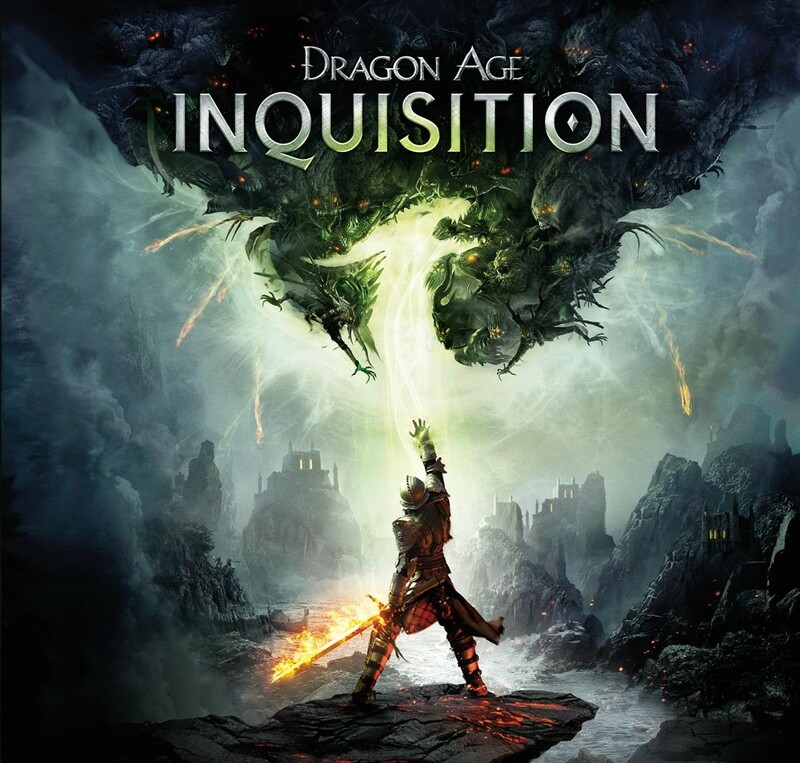 As for the lore itself, i’m not sure if there’s anything I can talk about since all three games share the same lore, but I would say that Inquisition is the most personal one to the lore yet. I mean like in previous games, you get to read about the world and the events. but they’re not mentioned directly in the story nor is it present. Inquisition manages to show you some of the depth of that lore through character, places, events, which is a nice way for the writers to take advantage of what they built in order to help make the story more interesting and captivating. However, something really bugged me. For a game that focuses too much on small details and character relations. Some encounters with returning characters were dull. For an example, a character named Morrigan and another one called Leliana are both returning companion characters from Dragon age origins. when they meet in Inquisition, it’s like if they never knew each other … that made no sense. Same thing goes for Hawke, Dragon age 2’s main protagonist. His role in Inquisition feels forced … I don’t wanna spoil how, but I think you’ll know once you meet him and see his role in the game. the main villain though … Uninteresting. I think he could have been better. So … enough about story, let’s talk gameplay ! The first Dragon age game had a strategic oriented combat system similar to some MMO games, while the second one was action oriented, which was more satisfying but kind of a let down to RPG fans. Inquisition mixes both. Combat is both strategic and action driven, giving you the choice of using a tactical view camera, which pauses everything in order to let you plan your next move. And the depth of the character customization is also back from origins, giving you the ability to customize all your party members to your liking, and leveling them up as you see fit. However, the combat mechanics itself feels out of place sometimes, especially when fighting with big enemies, the animation of some of the attacks won’t hit the enemy because of the collision system in the game (Pommel Strike ability to be more specific) and there’s a specific boss in the game that is basically a big chunk of glitches, you either kill it with the bugs or keep dying from the bugs. that was one of the most irritating boss encounters I’ve had in an RPG game. Though the other encounters make up for it. But it’s not about the combat only, exploration now plays a major role in Inquisition, unlike origins or 2 where the game felt kind of linear. You get big areas filled with countless side missions and interesting things to uncover. Though making areas this big kills that feeling of side missions that matter. In previous games side missions played big roles and had interesting events, but they weren’t a lot. 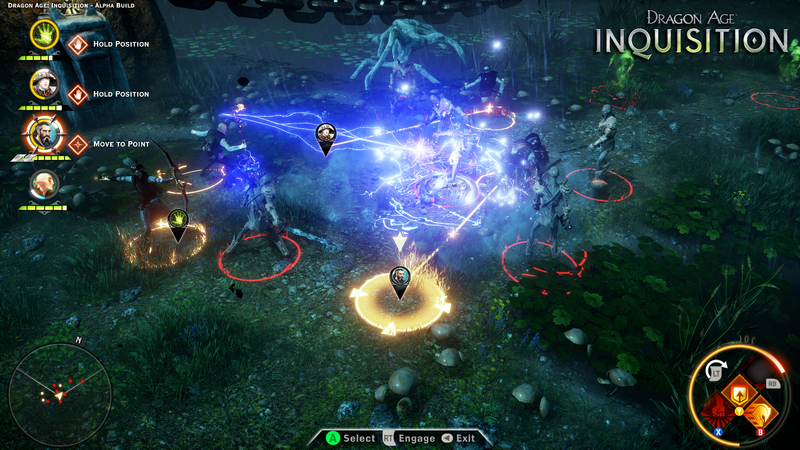 Inquisition fills your journal with side missions, but most of them are tedious tasks that are uninteresting … though some of them were very cool ! Approval system is back of course, making every decision you make effects the friendship of your companions with you, triggering personal missions or special dialogues/events. But it’s weird that it doesn’t actually show you how much approval the characters have, unlike origins and 2 in which you had the ability to see which character has low or high approval. Also the gifting system is kind of different this time. Gifts are not items that you give to your companions anymore, instead they’re triggered by how deep your relationship with a character goes. which in my opinion is actually better since it erases the possibility of missing a specific gift. One last thing I wanna talk about in gameplay is Dragon fights ! This game respects each Dragon encounter, it was my highlight in the whole game. Their fights are tense and challenging, and each encounter is memorable. I can’t really describe much, you have to play them to know how badass those fights are ! The game’s scenery looks stunning, the artists did an amazing job in designing those areas and making them feel authentic. Throughout the whole game, my eyes never tire from the beauty of the world. Origins and 2 barely showed anything, Inquisition goes crazy with the areas, scenery and details. and I LOVE IT ! Though the character face models could use some work. 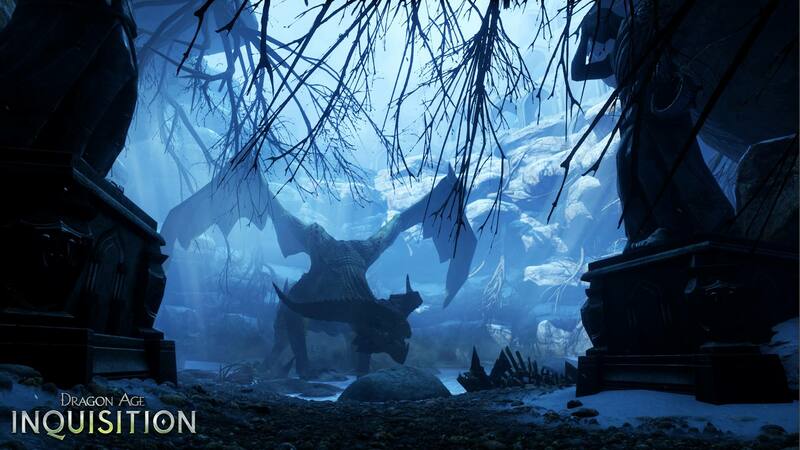 Some Dragon age Inquisition beauty. And the music … If life could be composed by someone, Trevor Morris would be my first choice after playing Dragon age Inquisition. It fits the tone of the game so perfectly, words fail to properly describe how majestic the score is ! it’s quite a drastic change from the score of the previous games. But seriously, it feels as if each track was designed for each event or encounter individually, and once you listen to them in those scenes … Chills … Chills everywhere. I’ll give you one perfect example. Pay close attention to the soundtrack that plays the first time encountering The Abyssal high Dragon, and you be the judge. It’s not part of the OST sadly, but watch the fight and listen to the soundtrack. Also here’s the main theme of the game, which is spectacular ! And one other thing I liked, is that there are Tavern songs that changes with the events that happen around you, so for an example when you recruit a rogue named Sera, the next time you enter the Tavern, they’re singing about her ! I thought that was awesome. So that’s about it, those are my personal thoughts on Dragon age Inquisition. I think it’s an achievement in storytelling and a very well done RPG game that deserves the game of the year award. Hands down my favorite game of the year ! ← Previous Post Greetings, fellow wanderer!